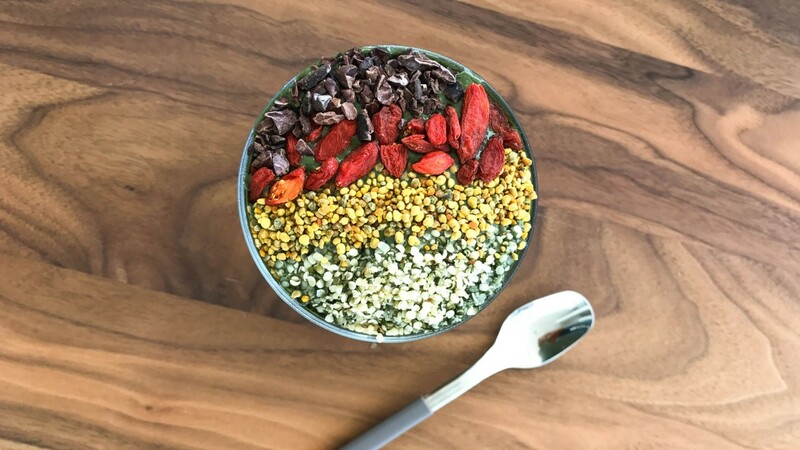 This adaptogen-packed smoothie recipe is almost all you need. When someone’s career trajectory spans from holistic nutritionist and natural foods chef, to model and former Bikram yoga teacher, you can be sure they’ve garnered a strong wellness game along the way. Vanessa Fitzgerald is just such a person, and her health-conscious journey really began when she was diagnosed with polycystic ovary syndrome (commonly known as PCOS)—an imbalance of female hormones which can cause a myriad of symptoms like ovarian cysts, fertility issues, insulin resistance, and disrupted bodily functions—in her late teens. According to the US Department of Health and Human Services, as many as one in ten American women of childbearing age are coping with PCOS. When Fitzgerald sought medical help for her condition, she left the doctor’s office laden with prescriptions that left her lethargic, wreaked havoc on her skin, and made her gain weight. While she still recommends consulting with a medical practitioner before making any decisions, she opted to explore natural remedies to soothe her symptoms. The California native is now on a mission to educate fellow sufferers on how to implement small changes with big health benefits. From adaptogenic supplements to collagen peptides, and the frightening ingredient that could be lurking in your cinnamon, she let us in on some eye-opening facts that might make you rethink what you put in your morning smoothies, PCOS sufferer or not. Ashwagandha, also known as Indian Ginseng, is a powerful, hormone-balancing Ayurvedic herb. The adaptogenic substance helps your body cope with stress, making it a no-brainer for Fitzgerald to include it in her blend. “PCOS causes women to develop insulin resistance, meaning their body does not respond as quickly to insulin,” she explains. “High insulin levels can cause the ovaries to produce more testosterone, resulting in a loss of menstrual periods, or in some, lead to acne or growth of facial hair.” Studies have shown that Ashwagandha can aid in increasing insulin secretion and help with improving insulin sensitivity in your cells. According to Fitzgerald, Inositol helps lower testosterone levels, improve insulin sensitivity, and restore normal ovulation. “There tends to be some correlation between PCOS and autoimmune disease. Women with PCOS often develop autoimmune problems with the thyroid, such as Hashimoto’s Disease,” she notes. “I like to play it safe and limit my intake of brassica vegetables such as broccoli, kale, and brussels sprouts. These can contain goitrogens, which disrupt the normal production of thyroid hormone by blocking the thyroid from taking in iodine,” she adds. “Raw cacao helps to elevate our mood and energy. However, once cacao is heated, it loses the majority of its nutrients, so it is important to consume it in its raw form,” Fitzgerald explains. Essential fatty acids are ~ NB ~ to your diet when you have PCOS. Healthy sources of fat like avocado, coconut oil, and nut butter help to manage weight by enabling the body to source energy from fat over sugar. “Our cell walls need healthy, high-quality fats so that we are better able to metabolize insulin, which keeps blood sugar regulated. Fats are also essential to our brain health, keep us satiated longer, and reduce fat storage,” Fitzgerald confirms.